Michigan Flyer-AirRide is Michigan's premier motorcoach service, offering 12 daily round trips between East Lansing, Ann Arbor, and Detroit Metropolitan Airport―and an additional round trip between two Ann Arbor stops and DTW―carries more than 100,000 passengers a year. A convenient, reliable service, Michigan Flyer-AirRide makes the trip for business travelers, families, students, and vacationers more relaxing and affordable. They contribute to the mid-Michigan economy while doing business and attending conventions here, and visiting family, friends, and our great universities. 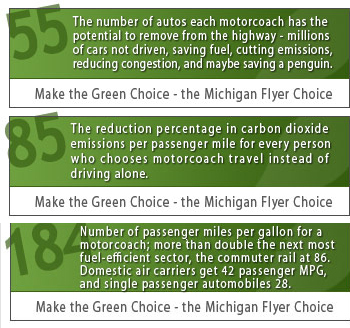 The Union of Concerned Scientists confirms that motorcoaches are the greenest travel option of all― compared with planes, trains, and automobiles― whether it’s one, two, or four passengers traveling 100, 500, or 1,000+ miles. Michigan Flyer was founded by Indian Trails, Inc., and Okemos Travel, in 2006. Michigan Flyer has carried more than 500,000 passengers since it began operations―and with an extraordinary 98% rate of on-time arrivals and departures. 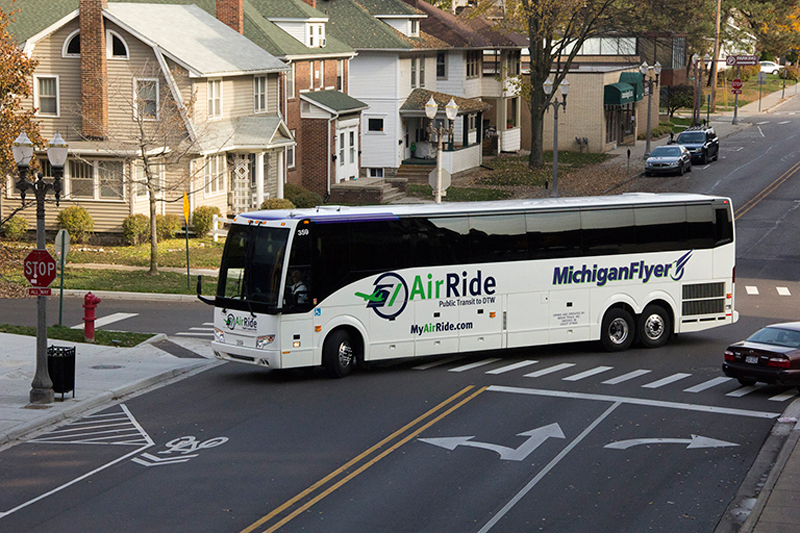 In April 2012, Michigan Flyer and the Ann Arbor Transportation Authority ("TheRide") formed a public-private partnership to provide near-hourly Michigan Flyer-AirRide shuttle service between Ann Arbor and Detroit Metro Airport from early morning to late evening, seven days a week. 1. Search for and download the "Indian Trails Bus Tracker" from the iTunes App Store (iPhone) or Google Play (Android). 2. Enter the code “flyer,” tap OK.
3. Tap "Departure" and select your boarding point from the scrolling list (e.g., East Lansing Marriott). 4. Tap "Destination" and select from the scrolling list (e.g. DTW McNamara Terminal). 5. Tap "Time" and select your scheduled departure time. 6. Near the bottom of the screen, select "Trip Status" to see the estimated time of arrival for your bus. 7. At the bottom of the screen, select "Tap to show map" to see your Michigan Flyer-AirRide bus traveling on the road in real time! 8. Zoom in on the bus to see it moving along its route. 9. To return to the home screen, click the Indian Trails logo in the upper left corner. 10. Tap "Website Link" to visit this site and find out more about Michigan Flyer-AirRide. Join the Michigan Flyer team! We are looking for an outstanding Customer Service Representative for a part-time position, one to three afternoons per week plus both Saturday and Sunday (approximately 20+ hours per week). Prior work experience required with basic computer skills. The Customer Service Representative is a front line contact for internal and external customers, and must possess excellent verbal communication skills. Duties include answering phones, taking reservations, clerical responsibilities with attention to detail, assisting with directions, and providing exceptional customer service. A team player with a positive attitude is essential. If you're interested, please send your contact info and resume to sales@michiganflyer.com. Indian Trails is Michigan’s first and largest privately owned bus transportation operator, carrying 1 million passengers more than 4.3 million miles annually. A family-owned business based in Owosso, Mich., Indian Trails offers one of the largest and newest fleets of motorcoaches in Michigan. And it has a 100-year history of innovation. Indian Trails was the first company to install two-way radios, video monitors, stereo sound systems, and WiFi on a fleet of buses. Indian Trails operates 33 scheduled inter-city routes throughout Michigan’s upper and lower peninsulas and into Chicago and Milwaukee―five in partnership with the State of Michigan. For tens of thousands of Michiganders, these routes are their only way to connect with the national transportation network of airports, Amtrak, and Greyhound. Indian Trails also operates a large charter service, as well as tours, shuttles, casino runs, and airport transfers. 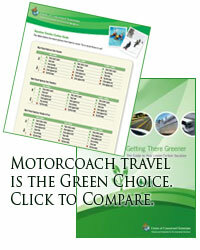 In 2010, Indian Trails was named the International Motorcoach Group 2010 Safety Award Winner. In 2012, the U.S. Department of Transportation ranked Indian Trails among the top 5% safest transportation companies in America. Click here to check for employment opportunities with Indian Trails or to submit an application online.